The next phase of Metro's SafeTrack program began Saturday, with part of the Red Line now shut down for 25 straight days. The Red Line is closed from Fort Totten to NoMa through Nov. 22, with the Rhode Island Avenue and Brookland stations closed. Metro officials are urging riders to be prepared for delays and crowded trains, or to make alternate plans. Red Line riders faced their first commute of Surge 10 of Metro's SafeTrack repair program Monday morning, with a much-traveled segment of the Red Line shut down for much of the coming month. Metro's busiest line is closed from Fort Totten to NoMa-Gallaudet U. through Nov. 22. The two stations between those stops -- Brookland-CUA and Rhode Island Avenue -- are closed. The shutdown started Saturday and will persist for 25 straight days, through Nov. 22. The impact is hitting residents of Northeast D.C. and Montgomery and Prince George's counties, cutting them off from downtown and the western parts of the region. On the first day of a major round of Metro repairs, News4's Molette Green checks how commuters are coping. The shutdown affects riders in Northeast D.C., Montgomery County and Prince George's County. After 9 p.m. on weekdays, Red Line trains are running only every 15 minutes. The last Red Line train toward Fort Totten will leave Glenmont at 11:02 p.m. each night, 35 minutes earlier than usual, Metro officials said. Weekend train schedules may change to coordinate with other track work, Metro said. 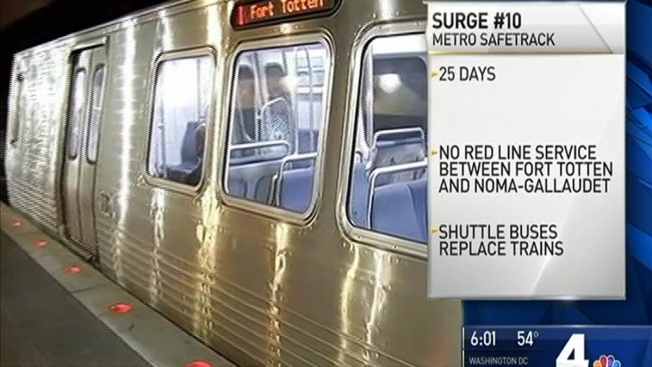 Limited free shuttle buses have replaced trains between NoMa and Fort Totten, officials said. Riders should also consider the Green Line as an alternative for those traveling between Fort Totten and Gallery Place. Metro riders should expect Red Line trains to be extremely crowded, especially during rush hour. Green and Yellow Line trains will also likely be crowded, officials said. Riders should expect much longer wait times. 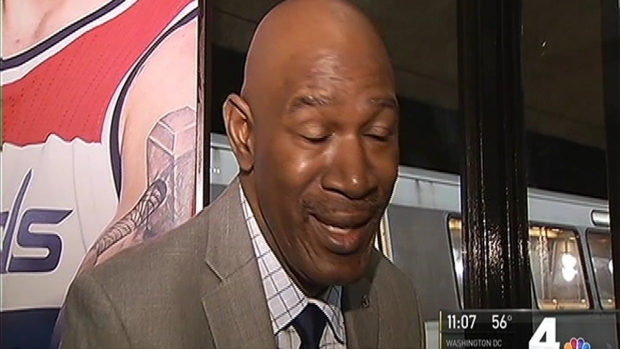 Metrobus: WMATA is encouraging riders to travel by bus as much as possible. To find a bus-only trip, use WMATA's online trip planner and choose the "bus only" option. See Metrobus timetables here. Regular Metrobus fares are $1.75, and 85 cents for seniors and people with disabilities. Express bus fares and airport express routes cost more. Bus-to-bus transfers are free if you're using your SmarTrip card. MARC Train: The Brunswick Line of MARC, Maryland's commuter train, is an option for commuters trying to get between Silver Spring and Union Station in downtown D.C. See the full schedule for the Brunswick Line here. Ride On Bus:Montgomery County's Ride On Bus system is fairly extensive and, yes, accepts SmarTrip cards. If you're trying to get to or from Silver Spring, Takoma or Fort Totten, or to other points in between, this could be a good option for you. In addition, Ride On Bus will be running free "Red Line" shuttles between the Silver Spring, Takoma and Fort Totten Metro stations. See more on those shuttles here. Biking: The Washington Area Biking Association (@WABA) previously tweeted this Google map of D.C.-area trails, bike lanes and bike-friendly roads. Find information on the best bike routes along the Red Line corridor here. If you need to tune up your biking skills, check out WABA's classes on learning to ride and urban cycling online here. Need to rent a bike? Capital Bikeshare stations are located throughout the area; you can see rates or sign up here. Lyft and/or Uber: You might want to download a ride-hailing app like Lyft or Uber if you haven't already. Find the Lyft app here for either iPhone or Android, and the Uber app on iTunes here or on Google Play here. Uber says UberPOOL, in which passengers share cars, are available across the entire D.C. area through the year of SafeTrack. Telecommuting: Hey, if it's an option, it just could work. And you don't even have to stay home all day -- Montgomery County is promoting its libraries as great places from which to telework. Resources include Wi-Fi, public computers, collaboration rooms, quiet study rooms, printers, photocopiers and secure charging stations for mobile devices, library officials said last week.